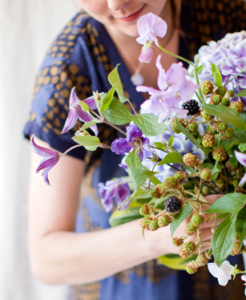 Jessica Blossom Clark (yes that really is her middle name) started her floral aspirations at the age of 13 under the tutelage of renowned florist/garden guru & bestselling author Thomas Hobbs at his iconic store in Vancouver’s Kerrisdale Village. After a stint working in New York on large scale events at prestigious venues such as Carnegie Hall & Lincoln Center, she returned home to Vancouver to work freelance, before opening her boutique flower shop Quince Fine Florals in 2007. Quince Fine Florals specializes in bespoke weddings & special events, with an emphasis on botanical & garden inspired designs & stylings. Her work has been featured in Canadian Gardening Magazine, Canadian House & Home, Real Weddings & The Vancouver Sun.